William H. Gass died on December 6th of last year, four days before my thirtieth birthday. He was 93 years old. His death didn’t provoke the outpouring of acclaim accompanying the passing of, say, Philip Roth or Tom Wolfe, but then none of his novels rose – he might say sunk – to bestseller status. Pick up his 1995 masterwork, The Tunnel – as I did, to mark his passing – and the sheer size and density of it will explain his relative obscurity: the general public prefer lighter fiction, in every sense of the word. My appreciation for Gass began with his essays, and in that I am not alone, for his nonfiction found the audience his fiction could not, and earned him a slew of awards: three National Book Critics Circle Awards and the Truman Capote Award for Literary Criticism. The latter half of the twentieth century was unkind to literature and literary criticism. The academy long ago succumbed to fashionable theories, at the expense of wider relevance, and the publishing industry has almost succeeded in driving out the last strongly opinionated reviewers – the sort of people who might practice criticism rather than public relations and thereby doom the print run of a sloppy work. Gass, by contrast, wrote criticism in the tradition of the great writer-critics, from Coleridge and Arnold through Eliot and Woolf, with the same care and concern as he approached fiction, for the simple reason that his reverence for the written word made any other approach impossible. 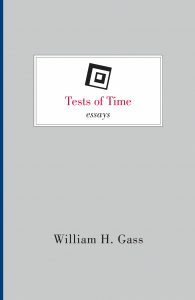 Tests Of Time, which appeared in 2002, continues that tradition, collecting essays on staple Gass subjects – namely, narrative and Flaubert – as well as a very unusual subject for Gass: politics. The opening essay, “The Nature of Narrative,” puts us in familiar territory, with Gass making a distinction between stories and fiction, to the detriment of the former. “We do tell ourselves stories in order to live. That is just another one of our problems, and one wonders will we ever grow up. But we do not tell ourselves fictions. Fictions are too complicated; often they are nearly as long as life itself.” Stories, Gass argues, are the mind’s mischievous way of imposing order and meaning on a world that provides us with neither. Or they have an “important social use” when they are “frequently repeated and dinned into the ears of children,” thereby sanctifying certain behaviors and morals, and damning others. Fiction, by contrast, is too complicated to be distilled into a set of easily digestible moral precepts, and that also makes it more honest, for it mirrors the complexity of life itself. […] narrative forms have always enjoyed a privileged position, as if they were the best mirrors of reality; indeed, the notion of the mirror (though it inverts) is beguilingly isomorphic. But the mind never did march, only its linear logic did; human character neither was built in a day nor let out its contents like a tap to a vat. Correlation replaced necessity, probability certainty; entities were full of elements made of entities, yet entities were exclamations of relation. Death was a destination, not a consummation, and life, though full of purposes, had none, and though everything in life was a sign, life managed, itself, to be meaningless. Story was a comfort, but if it was thought to be right for the realization of the world, except in the narrowest cases, it was the comfort of a lie. Whether you call this pessimism or realism, it’s the foundational Gassian belief, the reason for his contempt for mere plot (“Plot is liftable, transferable, interchangeable, transformable, because plot is only fried by its details and can be removed from them, served, brown and barely coated, on a warm plate”) and his preoccupation with form. My favourite of this volume’s essays, “The Writer and Politics: A Litany,” gathers momentum by listing all of the writers, throughout history, who have suffered for their involvement – real or imagined – in politics, culminating in a broadside against orthodoxy itself, that ultimate cliché. In every country, in every clime, regarding any rank or race, at any time and with little excuse, orthodoxy will act evilly towards its enemies. Survival is its single aim – that is, to rigidify thought, sterilize doubt, cauterize criticism, and mobilize the many to brutalize the few who dare to dream beyond the borders of their village, the walls of their room, the conventions of their community, the givens of some god, the mother-smother of custom, or the regimen of an outmoded morality – and even the Greatest Good itself could not fail to be bruised by such handling, and rapidly rot where the bruise had been. One sign of a sound idea is its fearlessness. Protect the truth and you put it away in the same place you have put those enemies you have saved it from. And any time a zealot speaks against freedom on behalf of a sacred thought, we must always listen for the anxiety in the voice, for such a voice is worried only about itself: to protect the profits it presently enjoys, to prevent the losses it fears in the future, and to avoid the penalties which just such fanatics have pain the past for their presumption. Don’t say this word; don’t say that one; you might give offense; you might uncover to others a squalid condition, even of your own; you might affront, disturb, step on a toe, put a nose out of joint. In the same moment a word is banned, a thought denied utterance, a point of view shut down for the season, the writer has a holy obligation to search for a sentence which will contain it, seek a place to speak the thought raucously aloud, formulate the point of view, not as if it were his own but as eloquently as if were his own. Given the choice between a noisy offensiveness and a polite silence, Gass opted for the former, not because he took any delight in offence itself, but because he understood the price of silence.